Severe burns can be life changing. They can cause excruciating physical pain and suffering leaving victims with permanent scars. The course of treatment and prognosis vary greatly depending on the degree and type of the burn. 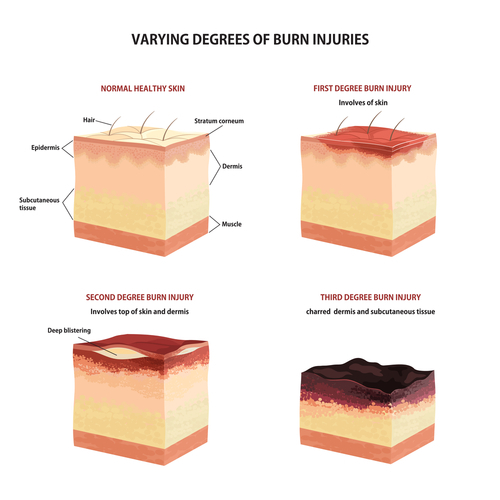 Burns can be categorized into degrees based on the severity of the injury and by type, which describes the source of the heat that caused the injury. First and second degree burns generally may be treated at home and leave minimal scarring, if any. Third and fourth degree burns are more serious and require immediate medical care. Treatment for severe burns may include surgery, fluid resuscitation, physical therapy and long term assistance. First degree burns, or superficial burns, cause minimal damage to the skin and typically heal on their own. The burn only affects the epithelium, the outermost layer of skin. Signs of a first degree burn include swelling and redness accompanied by pain at the injury site. The skin may feel dry and peel off as the burn heals in the days after the injury. Think of sunburn after a day at the beach. Treatment can usually be handled at home by running the affected area under cool water and applying aloe vera to calm the skin. Do not use ice! Unlike cool water, ice will not help the burn heal and may even cause a cold burn on the fragile skin. If running water is not available, wetting a clean towel and applying it to the burns may help. Many doctors recommend applying an antibiotic ointment such as Neosporin and loosely covering the wounded skin to prevent infection. Avoid using cotton balls on the affected area because the small bits of fiber can get stuck to the burned skin and act as a breeding ground for bacteria. Avoid using ice. Second degree burns are more severe. The damage extends beyond the outermost layer of skin into the upper layer of the dermis and often causes blisters, which may pop open. The skin swells and looks red, pink and/or white. Second degree burns may be further classified as either partial thickness or full thickness burns. The thickness refers to the depth of the burn regarding the layers of the skin. Partial thickness burns are evidenced by destruction of the entire epidermis and upper layers of dermis. They usually have blisters which appear wet. These are the most painful burns to experience. Most second degree burns heal within a few weeks but the worse the blisters are, the longer the skin will take to heal. Partial thickness burns do not usually require professional medical care and many can be treated the same as first degree burns. Many medical professionals recommend running cool water over the burned skin. Full thickness burns, on the other hand, will appear dry. They involve destruction of the entire epidermis and most of the upper and lower layers of dermis. Pain is present but usually diminished with damage to the nerves. If the burns cover a widespread area of the hands, feet, neck, face, groin or buttocks, or the skin does not immediately blanch (turn whitish in color when you touch it), emergency medical treatment is recommended. Skin grafts may be required to protect areas where the damage is deep or covers large portions of the body. Third degree burns destroy every layer of the skin. The damage extends into the subcutaneous (below the skin) levels and exposes fat, or adipose, tissue. The pain may be mild to nonexistent due to severe nerve damage. Like the most severe second-degree burns, third-degree burns are referred to as full thickness burns. Unlike a first or second degree burns, third degree burns cannot be healed by running water. Do not try to self treat a third degree burn! Immediate medical treatment is required. Medical professionals recommend keeping the injured area raised above your heart while you wait for treatment and preventing clothing or anything else from sticking to the burned area. Third degree burns can cause the skin to turn yellow to white in color and look like hardened wax or dark brown to black in color and appear charred depending on the cause of the burn. The skin will not blanch and may feel like leather when touched. Fourth degree burns involve destruction of every layer of the skin and the underlying muscle, fat tissue, tendons and bone. From the outside, fourth degree burns look the same as third-degree burns, except bones, ligaments and other internal systems will likely be visible. They are generally treated the same as third degree burns and require emergency treatment such as debridement (cleaning of the wounded area by removing dead tissue and foreign objects) and skin grafts. Never try to treat fourth degree burns on your own by using ice or cool water. Note: The classification of burns by degree is split into two theories. Some authorities use only three degrees of severity while others use four. On the three degree scale, burns that reach as deep as the muscle and bone are classified as third degree burns. The distinctions between first and second degree burns are the same under both systems. If you have been diagnosed with a third degree burn, it is helpful to find out whether your medical provider uses the three or four degree classification. This distinction will help you determine the extent of the damage to the subcutaneous tissues that have been damaged along with the skin. In addition to the 3 or 4 degrees used to label the severity of the injury, burns may also be categorized based on how they occurred. Chemical burns, sometimes referred to as caustic burns, are caused by contact with an irritant such as an acid or base. The caustic substance is usually an industrial or household cleaner, but natural substances like spicy peppers can cause burns as well. Chemical burns can cause a reaction with the skin or internally, if swallowed or inhaled. Internal burns can cause permanent damage to the internal organs and require immediate treatment. Chemical burns are commonly caused by car battery acid, bleach, ammonia, teeth whitening products, pool chlorination products and fireworks. They can also be caused by improper insertion of an IV into a vein or inhaling a toxic substance. People at greatest risk of suffering from a chemical burn are the elderly and very young, who may be unable to read labels or properly handle chemicals, and people who are exposed to chemicals at work. If your skin comes into contact with an irritant, immediately remove the chemical from your skin with a towel or gloves and rinse the skin with cool water immediately. If a chemical is ingested or comes into contact with the eyes, call the American Association of Poison Control Centers at (800) 222-1222 to find out how to handle the situation. You should seek emergency medical care if the burn penetrated the top layer of skin and the burn is more than a few inches long or if the burn is near a major joint, the face, hands, feet, groin or buttocks. 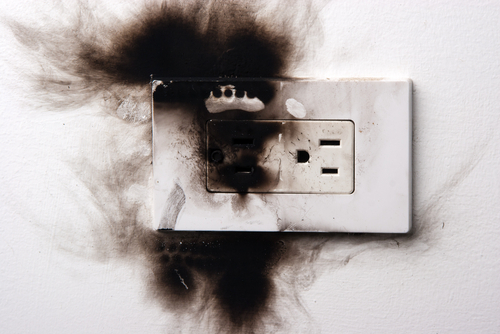 Electrical burns are caused by electrical current (AC or DC) passing through the body. Common sources include household current running through appliances and electrical sockets, stun guns and lightning. It is very difficult to tell the extent of the damage based on the outer skin alone because electrical injuries can travel through the nervous system and burn patches of tissue along the way or cause irregular contractions of the heart, known as fibrillation. In some cases, the electrical current is so strong the victim may be unable to let go of the source. People who work in close proximity with electric currents and outdoors during thunderstorms are at the greatest risk of electric burn. It is important to keep anything with an electric current away from water and refrain from putting anything except the appropriate cables in outlets. Never approach or touch a high voltage line or live wire. Shocks this large are more likely to cause electrocution (death caused by an electric shock). Thermal burns are what we typically think of when we hear of burns. They include burns caused by an external heat source such as fire. They may be further categorized by the method of contact with the skin into flash, flame, scalds and contact burns. Flash burns involve extremely intense heat for a very short period of time. Think of an explosion of natural gas, propane or other flammable liquids that ignites suddenly. 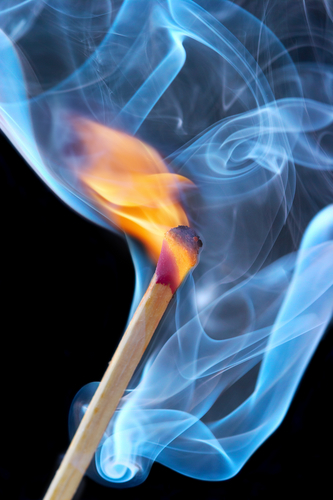 Flame burns are caused by prolonged exposure to intense heat. Think of a house fire, motor vehicle or boat accident or other fire that burns for an extended period of time. Scalds are burns caused by hot liquids. Many of us have experienced minor scalds while cooking with oil or pouring a cup of coffee. 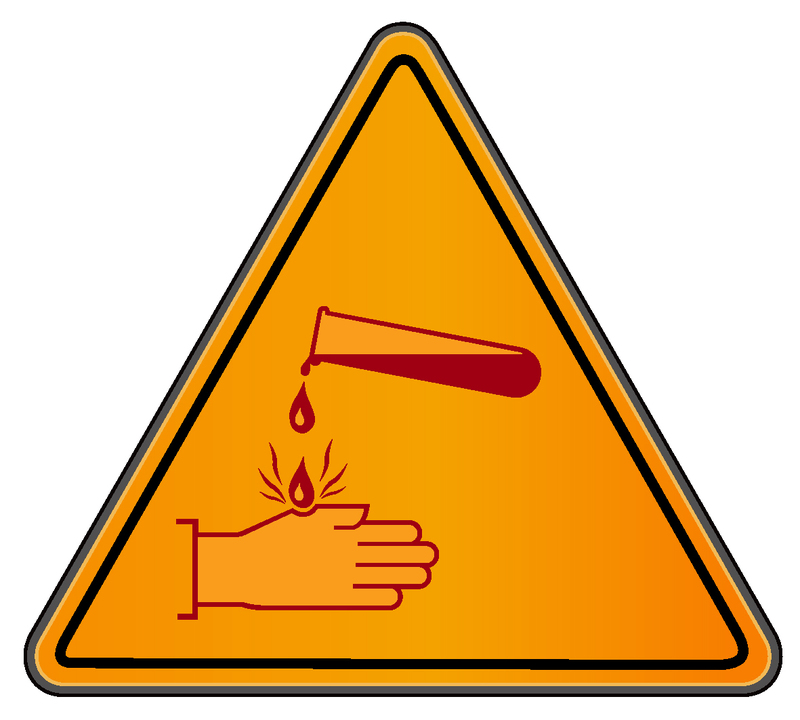 Other hot liquids like grease, tar and water can cause serious injury in a very short amount of time. Water boils at 212 degrees Fahrenheit. Water at just 140 degrees Fahrenheit can cause a deep burn, second or third degree, in just 3 seconds. Contact burns are the result of skin coming into contact with extremely hot solid substances like metal, plastic, coals or glass. Think of touching a hot coal on the grill or the metal rack in the stove. These burns can be very deep and may require professional medical treatment. Radiological burns, also called radiation burns and radiation dermatitis, can be caused by alpha, beta or gamma radiation. Ultraviolet rays by the sun are the most common source of radiation burns. However, they can be caused by tanning booths, sunlamps, radio frequency emissions, x-ray imaging and radiation therapy. 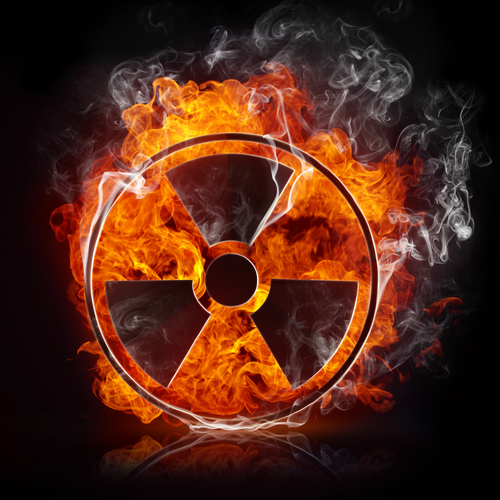 Nuclear emissions and explosions can also cause radiation burns, but these are extremely rare. X-ray related radiation burns are very rare but they do occur in obese people, because the skin needs to absorb more radiation to reach the same place in the body. They can also happen in long procedures when the radiation beam is aimed at the same place over and over again, irritating the skin, or from an equipment malfunction. Many people going through radiation therapy develop radiation dermatitis, where the skin shows erythema (it turns red) and becomes irritated. It occurs because radiation kills healthy cells along with cancerous cells, causing the skin to react by peeling, swelling, hair loss, decreased sweating, turning red and bleeding. Minor x-ray and radiation related burns can typically be treated at home by taking quick cool showers. Heat will irritate the skin so avoiding hot baths, sun tanning and tight clothing is important. The damage rarely requires medical intervention for the burn to heal; however, the side effects of radiation may cause subsequent medical issues. Every burn injury is unique. How the injury occurred, how long the body was exposed to the source of the burn and the immediacy of the treatment all have an impact on long term treatment needs and the extent of recovery. Whether you sustained a burn in an automobile accident, while riding your motorcycle or bicycle, from a firework explosion, or as a result of medical negligence, we hope you found the information to be helpful. Don’t hesitate to contact us with any questions you may have regarding your injury. We are here to serve you.